There’s something comforting about a rice bowl… even if it’s one just filled with vegetables. They’re filling, full of flavor, and delicious! Several months ago my good friend and cooking buddy Seung Hee came over with a plate of incredible beef short ribs. With a few extra ingredients that she brought from home, some items here-and-there from my refrigerator and pantry, she whipped up a wonderful rice bowl to accompany the ribs – that’s one of the great things about these bowls, you can really add whatever ingredients you like. This Asian Vegetable Rice Bowl is an inspiration from that evening. I’ve used wild rice as a base for the bowl, but feel free to use whatever type of rice you desire. 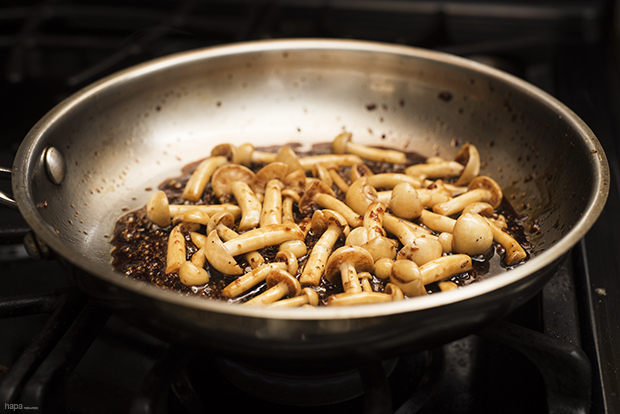 The mushrooms with a soy sauce and ginger/garlic reduction are rich and savory. The ‘smashed’ edamame with parsley and scallions is seriously packed with a ton flavor. The radish sprouts add a peppery profile and the poached egg, when cracked open creates a wonderfully creamy sauce with the yolk. 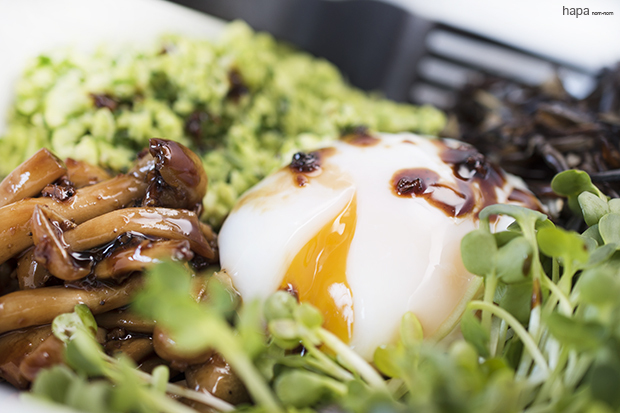 Together this Asian Vegetable Rice Bowl contains a sensational balance of flavors and textures. It’s a healthy way to fill up your tummy and treat your tastebuds to something new. Cook the rice and edamame (separately) according to the package directions. Drain the edamame and place in a food processor, along with the scallions, parsley, salt and pepper. Pulse until coarsely ground and set aside. Prepare the water to poach the eggs by bringing a large pot of water to a boil. While the water for the eggs is heating, in a small sauce pan over medium-high heat, add the soy sauce, rice vinegar, mirin, ginger, garlic and sugar. Stirring occasionally bring the sauce to a low boil, then reduce the heat to a simmer. Stirring frequently, cook until slightly thickened. (Keep and eye on it, you don't want it to become too syrupy). In a skillet, warm the olive oil over medium-high heat. Add the mushrooms and sauté for 2 minutes. Add the soy sauce reduction and sauté 1 minute longer. Remove from heat and set aside. Crack the eggs into two small, separate bowls. Add 1 tablespoon of white vinegar to the pot of boiling water. Turn off the heat. Using a large spoon, make a whirlpool in the water. Gently slide the eggs, one-by-one, into the center of the whirlpool. Cover the pot with a lid and allow to cook for 3 minutes. While the eggs are poaching, prepare the rice bowls. Add the rice, the smashed edamame, mushrooms, and radish sprouts. (Reserve some of the soy sauce reduction for garnish). When the eggs are done cooking, use a slotted spoon to remove the eggs, and gently blot on a paper towel to remove the excess water. Transfer the egg to the rice bowl and place on top. Garnish with any remaining soy sauce reduction, serve, and enjoy! Just saw this. Yay! Awesome post/photos. Your version look wayyyy prettier. 🙂 Next recipe…..short ribs??? Aww, thanks. You’re idea was so inspirational, I had to give it a go! And you know I’m up for short ribs any time! You freak me out. Do you know what I just put in my freezer because I ran out of time to cook it this weekend? Beef ribs. Seriously. I rarely buy beef ribs, maybe twice a year max. Can you believe the coincidence?? Only you can get me so excited about a bowl of veggies! YUM. 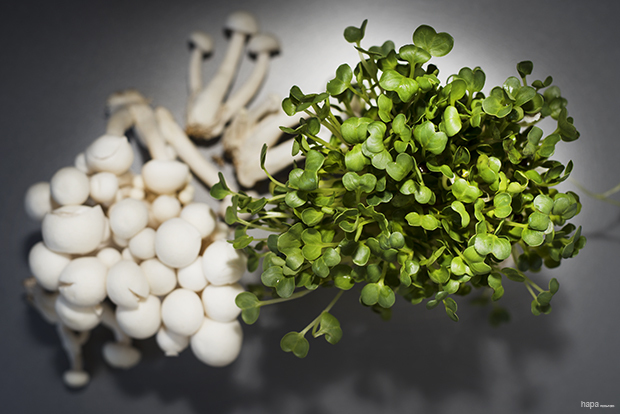 In particular I’m obsessed with shimeji mushrooms! They’re so pretty 🙂 Love that photo you have of them raw! Ha! This certainly wouldn’t be the first time we’ve had an around the world psychic food connection! You’ll have to let me know what you do with those beef ribs – I’m sure it will be amazing! Kathleen … that runny egg is making me swoon! This sounds like a delicious, not to mention healthy, idea. It’s like a breakfast/brunch/lunch/dinner Euro-Asian fusion dish. Love it! I love a good rice bowl – they’re so versatile and satisfying. I love that you can make every bite different. Me too! You can really customize them to your tastes.